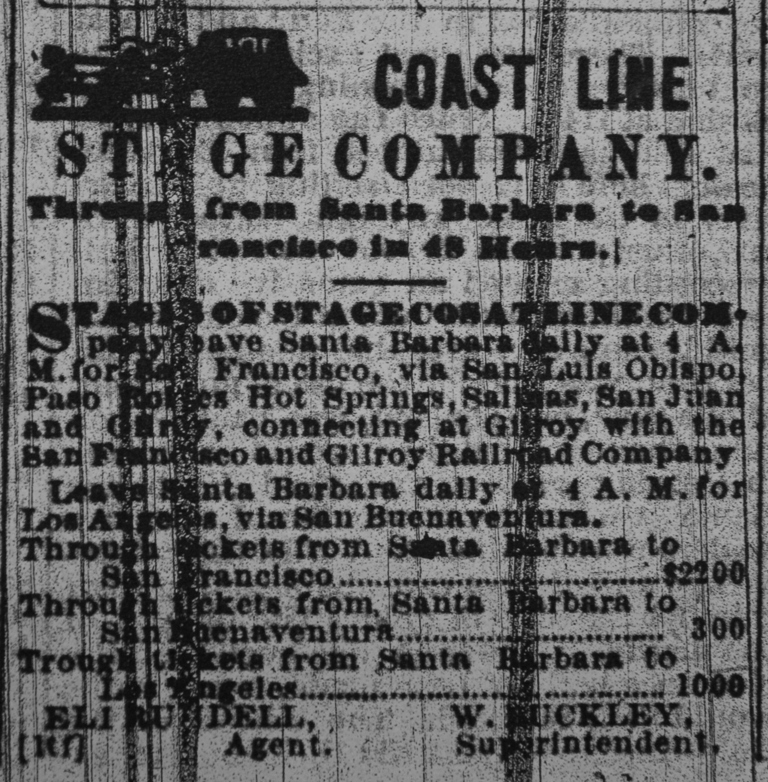 A newspaper ad for Coast Line Stagecoach Co. published in the Santa Barbara Weekly Press (1873). In 1873, twenty-two dollars ($375.00 in 2010 inflation adjusted dollars) got you a two-day ride on a stagecoach to San Francisco. That must have been one hell of a roll! Leave at 4 a.m. climbing over the Santa Ynez Mountains and then on up state a few hundred more miles over dusty, bumpy, dirt roads. Confined for two days in the stage cab with whoever else bought a ticket. Nowadays, to travel the same route takes about five hours or so. It means lounging in upholstered captain’s chairs with padded arm rests in four-wheeled, individual motorcoaches with power steering, air conditioning and drink holders at hand, while cruising down the smooth super slab at 75 miles an hour listening to music. One finger and one toe is all it takes to drive my gas powered stage, speeding over the level smoothness of an endless ribbon of pavement. Never far from a super market stuffed to the rafters with tasty food and drink or an AMPM minimart’s “too much good stuff.” I travel over the very same road as the Coastline Stage Company, many of the same trees are still alive along its course and the sandstone outcrops look the same, but it might as well be a different planet. 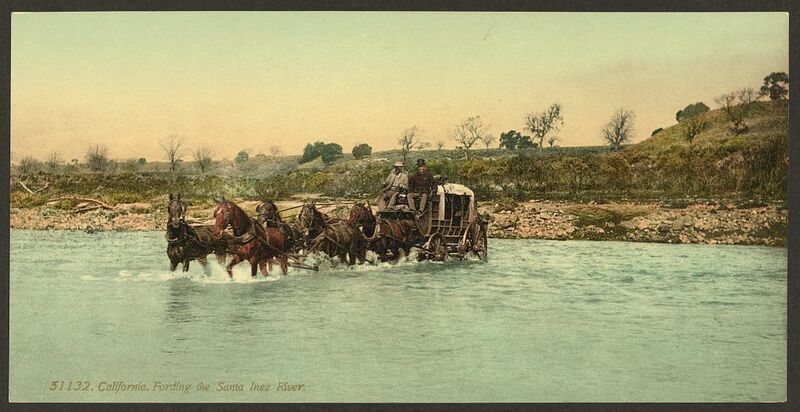 A stagecoach fording the Santa Ynez River in Santa Barbara County circa 1900. In his book, Stagecoach Days in Santa Barbara County (1982), local historian Walker A. Tompkins relates a list of rules and guidelines for stagecoach passengers traveling in the Santa Barbara area. The “Ten Commandments of Stage Passengers,” as they were called, were purportedly posted at boarding stations as well as inside the stage cab. The rules covered what was considered polite behavior and what was rude and unacceptable. They dealt with such things as foul language, smoking and “unchivalrous behavior” around women, as well as snoring, using other people’s shoulders as a pillow and the use of firearms. But apparently the most important rule, judging by it’s placement on the list as number one, regarded the consumption of liquor. Abstainance [sic] from liquor is preferred. If you must drink, share the bottle. To do otherwise makes you appear selfish. And don’t overlook the driver. This entry was posted in Santa Barbara County and tagged Coast Line, History, Old West, Postcards, Stagecoaches, Writing. Bookmark the permalink. “many of the same trees are still alive along its course and the sandstone outcrops look the same, but it might as well be a different planet.” That is so very true, something that I try to remember often to help me stay grounded. Excellent post! As always! Me too. It sounds like we may think alike. Jack, you should have been my history/geography teacher in high school. I was a failure at the subject, and while it might have been a lack of interest on my part that shut off the wheels to my brain when I went to that class, I prefer to blame my teacher for squeezing all the joy out of it. And here you are getting me to love everything you write about the history of a place that I’ve never been to and probably never will see! Thank you for showing me what fun a little history can be. Hey Dave. Glad to hear you enjoy what I’m offering. Thanks for reading and for your comment! I appreciate the kind words. Hi Jack, what do you know of J. B. Crandall, who drove for the Coast Line Stage Company before he was killed in a stage accident in 1872? Hey Cheryl. I don’t know anything about Crandall. I’m researching Crandall for a book about stagecoaching in N. California. Thanks anyway, it was worth a try!